Tanzanite is member of the Zoisite family, a calcium aluminium silicate mineral. It’s crystal system is orthorhombic, and it forms prismatic, usually striated crystals. The colour ranges from blue-violet, although some crystals are golden to brownish yellow. When heated to around 900 degrees Fahrenheit, the crystals with yellow tones turn to blue or blue-violet. Tanzanite was first discovered in 1967 in Tanzania, Africa. The name was introduced by Tiffany and Co., the New York jewellers. This has become the name accepted around the world, though scientists refer to it as Blue Zoisite. 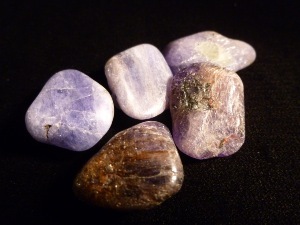 Tanzanite is said to align the heart and the mind, allowing for a more balanced, centred experience of spirituality. For those with hyperactive minds but little emotional connection to others, Tanzanite may be the link to help ground mental energy through the emotional body. 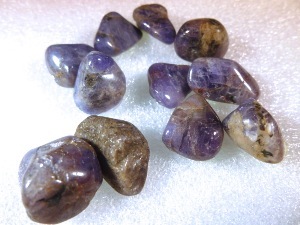 Emotionally Tanzanite is said to helps one feel more compassionate, loving and centred. It may assists on in gaining insight into emotional issues but prevents one from dwelling on them unnecessarily. 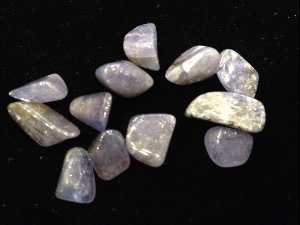 Tanzanite is considered to generate an energy of happiness and relief from worries. Tanzanite is said to be used to help calm the overactive mind and assist in healing work by synchronising the heart’s and brain’s electromagnetic energies.